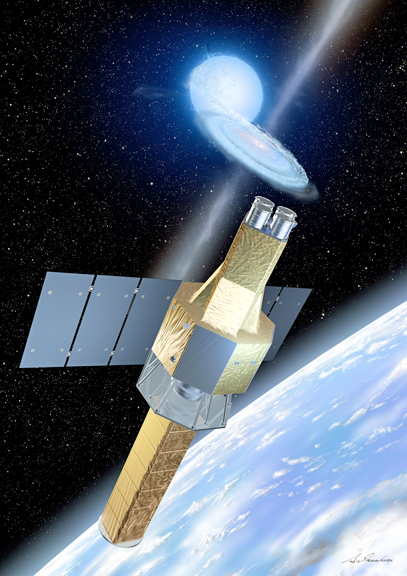 The Japan Aerospace Exploration Agency (JAXA) established the emergency headquarters led by President Okumura and has been doing its utmost to understand the anomaly of the X-ray Astronomy Satellite ASTRO-H (“Hitomi”). Most of the analyses, including simulations on the mechanisms of object separation, it is highly likely that both solar array paddles had broken off at their bases where they are vulnerable to rotation. Originally, JAXA had some hopes to restore communication with ASTRO-H since the organization believed they had received signals from ASTRO-H three times after object separation. However, the organization had to conclude that the received signals were not from ASTRO-H, due to the differences in frequencies as a consequence of technological study. Artistic rendition of JAXA's ASTRO-H satellite. JAXA has also received information from several overseas organizations that indicated the separation of the two solar array paddles from ASTRO-H. Considering this information, JAXA has determined ASTRO-H’s functions cannot be restored. Accordingly, JAXA will cease the efforts to restore ASTRO-H and will focus on the investigation of anomaly causes. All phases from design, manufacturing, verification, and operations will be examined to identify the causes that may have led to this anomaly, including background factors. "JAXA expresses the deepest regret for the discontinuation of the operations of ASTRO-H and extends sincere apologies to everyone who has supported ASTRO-H believing in the excellent results ASTRO-H would bring, to all overseas and domestic partners including NASA, and to all foreign and Japanese astrophysicists who were planning to use the observational results from ASTRO-H for their studies. JAXA also would like to take this opportunity to send our profound appreciation to all overseas and domestic organizations for all of their help in confirming the status of ASTRO-H through ground-based observations and other means."